Metro Éireann, in collaboration with Duke University’s Kenan Institute of Ethics, invites young writers living in Ireland to submit original works of writing to its third annual intercultural writing competition. Over €3,000 to be won in prizes! Announcing the 2017 writing competition, Bill McCarthy, coordinator of the project, said, “Writers between the ages of 14 and 21 – immigrants and non-immigrants – are encouraged to enter submissions that explore the ethical challenges associated with intercultural diversity in Ireland. “Submissions are due by midnight on July 30, 2017, and may take one of three forms: a short story of no more than 2,000 words, a novel extract of no more than 2,000 words or a selection of poetry comprising no more than five poems,” he added. All submissions must be typed using 12-point Times New Roman font and double-spaced. They should be sent to info@metroeireann.com with the entrant’s full name and the word “submission” in the subject line. Each submission should include a cover page with the entrant’s name, age, address and telephone number. The cover page should also include details about the entrant’s submission, such as its age category and title. Cash prizes will be awarded in three categories. There will be an ages 14 to 17 winner and runner-up, an ages 18 to 21 winner and runner-up and an ages 14 to 21 Spirit of Intercultural Ethics winner. Each winner will receive 800 euros and each runner-up will receive 400 euros. The winning submissions may also be published in Metro Éireann. Judges will select winners and runners-up according to a list of criteria: engagement with the themes of ethics and intercultural diversity, creativity and originality, organisation and structure, impact on the reader and initiative of beginning writers. Winners will be announced through an awards ceremony on August 4, 2017. 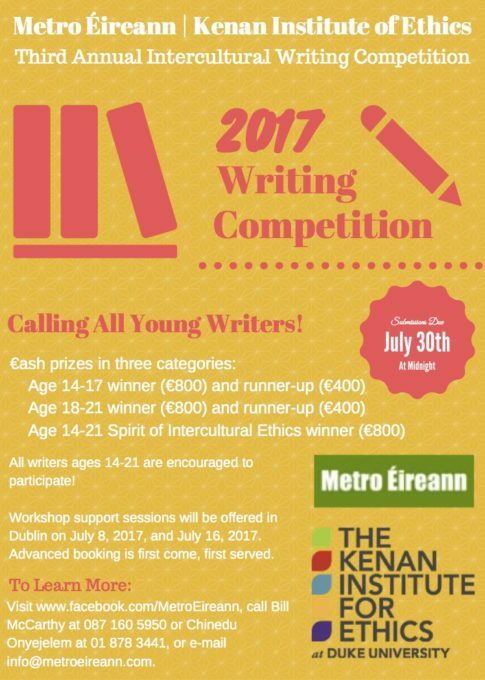 Workshop sessions will be held in Dublin on July 8, 2017, and July 16, 2017, for entrants seeking guidance with their writing. Advanced booking for those sessions is first come, first served. For more information, please visit https://www.facebook.com/MetroEireann/, contact Bill McCarthy at 087 160 5950 or Chinedu Onyejelem at 01 878 3441 Monday through Friday between 10 am and 5 pm, or email info@metroeireann.com.